Fenn Kayak UK » Welcome to the Fenn Kayak UK website. We are the official importers of Fenn Kayak's into the UK. FENN Kayak have been building World Championship level Skis for over 30 years.They now have one of the most comprehensive lineup’s of paddle Ski’s in the world. Whatever your level of skill you will be able to find a ski that will be perfectly suited to you. Ocean Sports UK are the official UK importers of FENN Kayaks. Surf Life Saving LS: this is a game changer responsive yet stable, punching through waves and accelerates onto any bump. Options of low seat perfect for club paddlers or high seat for the ski specialist. BlueFin: a surfski that allows a paddler to immediately get out on the water, learn technique later. Mako XT: Your balance has improved and you want more speed. Swordfish: 90% of surfski paddlers worldwide should be in this surfski. It offers amazing downwind ability combined with way more speed yet similar comfort compared to the BlueFin and XT. Elite: A top end high volume racing surfski that outperforms any other surfski in downwind conditions. In flatter conditions it fairs well. Slightly more stable than the SL and Glide. Elite Glide: All the downwind elements of the Elite but with much improved small and flat water design. Perfect for UK and European conditions. Less stable than the Elite, more stable than the SL. Elite Spark: All of the attributes of the Glide reduced in volume for paddlers 80kgs and less. Elite Double: no other double surfski comes close, without doubt the most successful surfski of any kind across the globe. The LS is an around the cans ski or Surf Life Saving spec ski and is about to be the first South African designed surfski that will be accredited to be used in Australian Lifesaving competitions. Due to the compulsory specifications required to be accredited, there is limited room for hull design. However, Fenn has created a ski which really stands out in one key feature: it’s ability to cut through a swell and chop. This is particularly noticeable when turning the Apex can and heading back to the beach. It feels like the ski actually parts the swell in front of you and it effortlessly glides form one swell to the next. It is going to be interesting to see what kind of results this surfski gets. The pedigree of this ski has already been proven with Matt Bowman winning the 2014 world surf ski title. The LS comes with two seat heights to cater for big rough conditions or increased stability for newer paddlers. The high seat provides maximum paddling efficiency for the serious paddler. All skis are fully adjustable with carbon footplates and come in white. The Blue-Fin is a super-stable, super-light ski ideal for beginners and intermediate paddlers, an ideal transition craft from sea kayak to surfski. From the bow to the back of the cockpit it is pure surfski, from the cockpit to the rudder housing it is more kayak-like, and from the rudder housing to the stern it tapers like a “normal” ski. The kayak like 1.5m section from the cockpit back is where the effortless stability comes from. The Blue-Fin has a great turn of speed especially against the flow and in ocean waves where this boat excels in catching runners and big swells. The 44cm cockpit, comfortable foot-well, inherent stability and a reasonably flat deck behind the cockpit gives this ski great distance capability allowing you to paddle for longer and in more comfort than any other ski in this class. Available in: Fibreglass(weight 17kg), Vacuum Bagged Fiberglass(weight 14kg), Hybrid – fibreglass/carbon(12.5kg) and Carbon(10kg). For many years, the XT has been the de-facto standard in beginners’ skis. Even today, there are few entry-level skis to compare for comfort, strength and stability. Dawid Mocke should know – the founder of the first Surfski School in South Africa chose Fenn XTs when it came time to replace the school’s fleet in 2008. Available in: Fibreglass(weight 17kg), Vacuum Bagged Fiberglass(weight 14kg), Hybrid – fibreglass/carbon(12.5kg) and Carbon(10.5kg). FENN SWORDFISH – Intermediate Designed specifically for the intermediate paddler. The Swordfish offers amazing downwind surfing ability, and is the next step up from the Fenn XT or for those looking for greater speed and a new challenge. The Swordfish easily picks up the runners similar to the more advanced skis but offers the paddler more stability and therefore comfort and control in bigger conditions. 90% of surfski paddlers worldwide should be in this surfski. It offers amazing downwind ability combined with way more speed yet similar comfort compared to the BlueFin and XT. Available in: Fibreglass(weight 17.5kg), Vacuum Bagged Fiberglass(weight 14.5kg), Hybrid – fibreglass/carbon(12.5kg) and Carbon(10.5kg). Available in: Fibreglass(weight 17.5kg), Vacuum Bagged Fiberglass(weight 14.5kg), Hybrid – fibreglass/carbon(12.5kg) and Carbon(11.5kg). 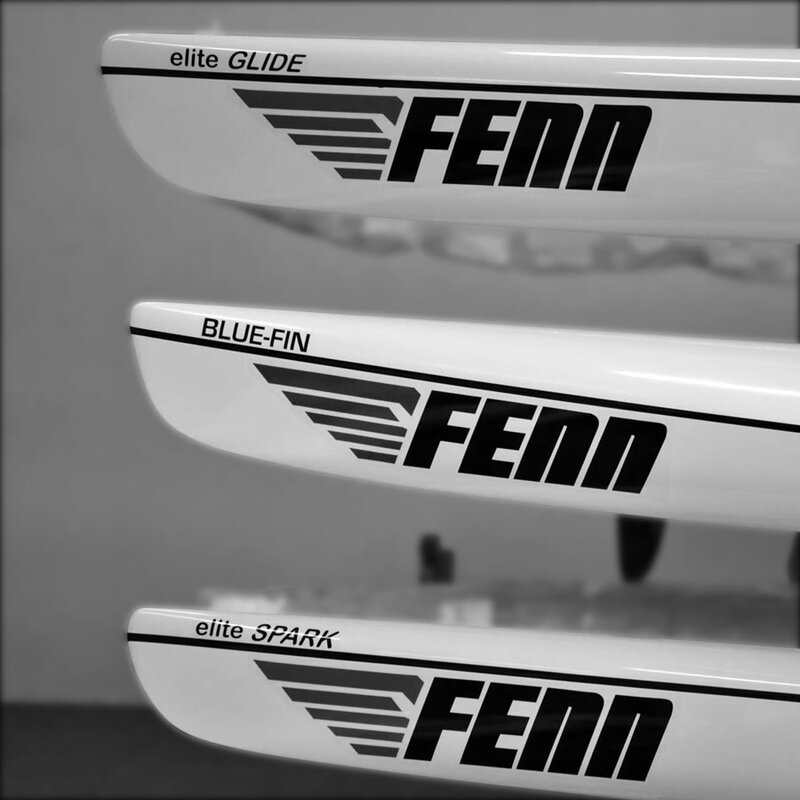 Fenn Elite Glide – is one of the latest models released by Fenn in the last 18 months. The ‘Elite Glide’ has been designed based on the very successful Elite. With a reduction in rocker, subtle shift forward in seat and rudder, combined with a reduction in the ‘hump’ in the cockpit area and a width of only 42.5cms this ski fly’s. The Glide is ideally suited to UK and European smaller chop conditions while retaining the superior Elite downwind surfing pedigree. Available in: Hybrid – fibreglass/carbon(12.5kg) and Carbon(10.5kg). Available in: Fiberglass(14.5kgs), Hybrid – fibreglass/carbon(12.5kg) and Carbon(10.5kg). The Elite S is the latest from the Fenn stable. The ‘S’ has all the traits of the Elite but with some changes. The seat is further forward making the ski sit flatter in the water. The rudder is further forward making the ski even more manoeuvrable than the older Elite. The hump between the seat and footwell has been reduced and the footwell is lower. There is some volume taken out of the nose. In essence the Elite S has all the re-known surfing characteristics of the Elite while bringing in the flat-water qualities that the Glide and lower volume Spark offer. This is a ski for good paddlers but has more stability than some of its rivals in the same class. No other double surfski comes close, without doubt the most successful surfski of any kind across the globe. Available in: Fibreglass(27kg) and Carbon(18kg). Based on Carbis Bay Beach near St Ives in Cornwall, Ocean Sports UK is run by Glen Eldridge and his family. Offering a wide range of ocean based activities and being a professional Ski Paddler himself, Glen’s knowledge of the sport is vast and he is always willing to help out and find the right ski for you. Carbis Bay is one of the most beautiful Bays in the Country and the Ocean Sports Centre can offer you some of the best testing facilities in the UK including a full line up of the 2015 FENN KAYAKS. We run a full program of paddling events throughout the year. We cover all ages and levels of experience. Our Kids clubs in the summer are the perfect introduction to the amazing world of watersports. If you are serious about paddling we have training camps and programs which will help you get to the next level. Please get in touch whatever your requirements, we would love to see you down at the beach. For more information about the facilities available at the Ocean Sports Centre please visit our website. If you have any questions about Fenn Kayaks or the Ocean Sports Centre drop us an email and we'll get back to you as soon as we can.